But no more need, this hits it ok.
Had to smile about fisticuffs, never heard that one before. Thanks for the translation jno. Poor Doris. That fan was one deluded woman. I know Martin Shaw is very reluctant to meet fans or sign autographs. He had a weird woman stalking him for years that went to court. Lewis Collins was renowned for his romances over the years prior to his marriage (even when he was in Australia for the play 'DeathTrap' in 1986) but confusing fantasy with reality is scary. It makes actors scared to meet the 'normal' fan who just wants to say Thanks for being a part of my childhood tv viewing and getting an autograph. I wrote a film review of 'The Commander' about 5 years ago. I'll give it another run on the internet. 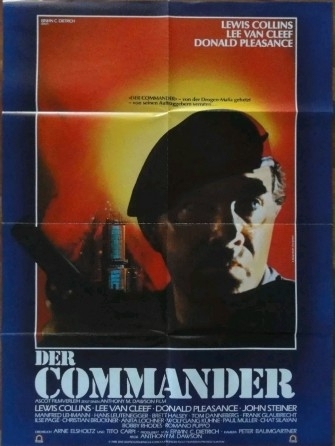 "The Commander was the last in the series of Anthony M. Dawson films starring Lewis Collins. I recommend it above the other Collins' army films because it has a clearer storyline and characters with secrets that are slowly revealed throughout the film. It is visually pleasing with wonderful panoramic settings captured with more skill than the previous army films. Lewis Collins stars as Major Jack Colby who is declared the best and most expensive mercenary by his old Colonel played by Lee Van Cleef. Power and money in the treacherous world of drugs drives the actions of a major drug lord in Cambodia. We follow Jack Colby's mission gathering men in Bangkok to accompany him on a dangerous arms delivery to Cambodia. The assignment is overseen from Berlin by Henry Calson in a small role played by Donald Pleasence. The inclusion of a woman on the mission (Ling played by Chat Silayan) provides the expected corny jokes from the soldiers which does date the film somewhat. Through the jungles of Cambodia, the audience slowly discovers the true nature of this band of soldiers. Rescues, captures and hidden identities sustain audience interest with a seemingly endless supply of explosions, gun battles and combat providing the expected and impressive fireworks and action sequences. The plot is wholly interesting enough but the script disappoints in the dialogue between the characters during an explosive action sequence. The music track is invasive in a poignant scene which may have been more dramatic if the actors were allowed to convey the emotion of the scene without musical assistance. At this point in the film it is best to just be taken over by the explosive action and enjoy the powerful pyrotechnics. The twists and turns within the film offer some unpredictable surprises. The Commander has glorious settings which are full of colour supporting the elements of mystery and intrigue. From the green jungles of Cambodia, the city of Berlin, the Grand Palace and busy bars of Bangkok to the beauty of Naples, it is an abundance of rich exotic locations. Sweeping camera pans and steadily framed shots make this Erwin C. Dietrich production technically the best of the Collins' army films. 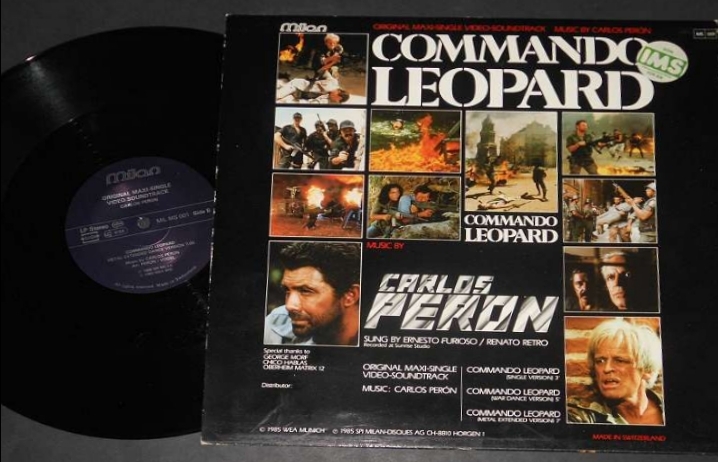 Many actors from Codename Wildgeese (1984) and Commando Leopard (1985) reappear in The Commander and for fans it is pleasing to recognise these repeat performers. Thomas Danneberg, Lee Van Cleef and Manfred Lehmann play alongside Lewis Collins again. Manfred Lehmann always has a strong screen presence and his experience shows in his portrayal of the unpredictable womanising soldier, Mason. The scenes between Lewis Collins and Manfred Lehmann are the strongest in the film with the two actors bringing out the best in each other's performance. Lewis Collins looks confident and comfortable in the role of Jack Colby. He is physically fit and is equally convincing playing the mercenary in the jungle or the suited attractive traveller in Naples. It is not considered a demanding role for Collins as an actor with the guarded character of Jack Colby not providing any challenge for an actor of Lewis Collins' ability. Even so I enjoyed the film and fans of his work will surely enjoy seeing Lewis Collins in the action adventure, The Commander." That is a good film. Those mercenary pics were fun and watchable enough. Available at all good high street vinyl stores! Not classics destined for the National Film Archives perhaps, but I imagine he got fairly well paid to jet about the globe playing cowboys and indians in loads of exotic locations. There are worse ways of earning a crust. 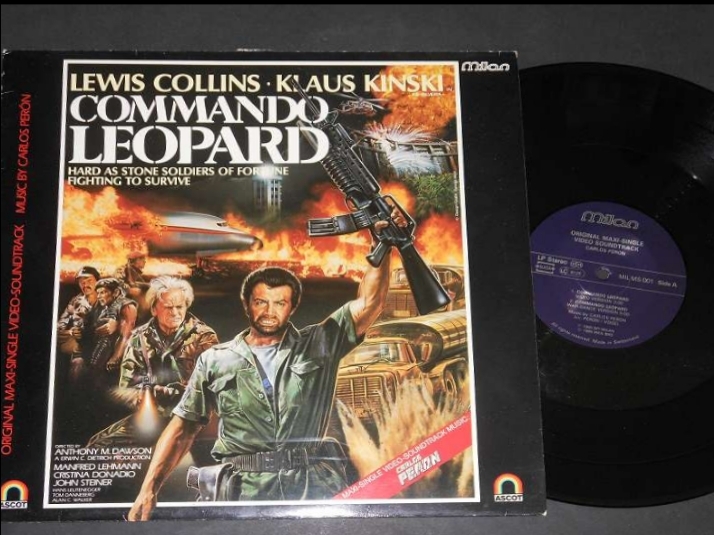 German DVD boxset been out for a while, clearly put together by a Lewis Collins fan. Looks a great set and those will be the Uncut versions not like the butchered ones we get in the UK. 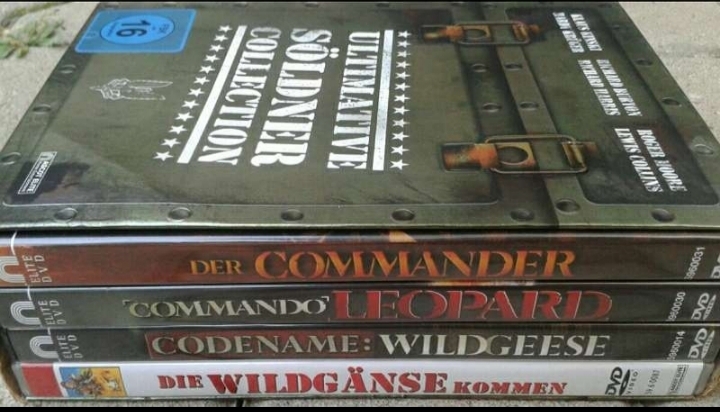 One feedback comment (in German) on the Amazon.de comments page suggests just 'Codename Wildgeese' is cut by 17 minutes in this set. The 17 minute cut version is the one we get in the UK. Oh dear! I have a German BD which is fully uncut. It's not hard to figure out what would be cut from Codename:Wildgeese, if you've seen the movie, but 17 minutes is a fair size chunk of the running time.